Who: Retailers and brands selling online. What: Drop shipping “is a method of fulfillment where the retailer you’re buying a product from does not keep the item it’s selling in stock. That item is purchased form a third party, usually a wholesaler or manufacturer, where it is then shipped directly to the customer” (Forbes.com). Why: Implementing a drop ship program enables retailers to open up expanded assortment (endless aisle). They can carry a limitless product category without needing to warehouse or fulfill the orders themselves. 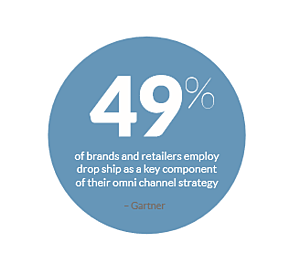 Brands benefit from implementing drop ship because they can sell their goods on more channels. How (Getting Started): Depending if you are a retailer or brand, the steps to getting started will vary slightly. For retailers, entrepreneur.com has a great article that outlines the basics of getting started. For suppliers, retailers will reach out to you when they begin setting up their drop ship program. To increase awareness, you can work to get your brand into a paid drop ship directory. While drop shipping continues to increase in popularity, it is not an entirely fool-proof practice. Inventory issues, shipping complexities, supplier errors, and tough competition are the top issues that arise, we have a list of best practices to help minimize (and even eradicate) them. Choose the right partners – Mistakes happen. It is not uncommon for shipping errors to occur. However, in the case of drop shipping where a 3rd party fulfills an order for a retailer, the retailer must take full responsibility for any errors. Retailers can minimize risk and ensure a smoother resolution process by selecting the right partners. Shopify has put together a helpful post to assist with vetting vendors. Good UX – Separate yourself from your competitors by investing in a modern, high-quality website. Looking for some design inspiration? Our friends at Something Digital share 5 UX/UI Principals that Evoke Joy. Choose Automation – Managing multiple vendors can be difficult without the right tools in place. 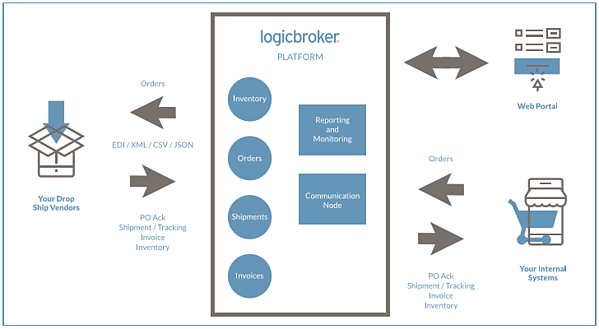 With a solution for drop ship automation in place, retailers can leverage a portal to track vendor compliance, manage orders/exceptions, and resend EDI documents if necessary. A huge benefit to drop shipping is keeping inventory in stock. With drop ship automation, inventory updates are sent in real time thus giving retailers accurate visibility to stock levels. Brands benefit from drop ship automation by meeting retailer compliance requirements (via EDI/XML/CSV/API) and eliminating manual touch-points associated with traditional drop ship order fulfillment. Both brands and retailers benefit from the faster onboarding of partners with drop ship automation and flexible communication protocols. Drop ship automation enables both brands and retailers to capture more sales and enjoy a shorter order fulfillment cycle with the automated exchange of order documentation in real-time. By electing to implement a drop ship program, retailers can grow their business without growing their warehouse and brands can sell through unlimited retail channels. With the ability to offer numerous virtual products that won’t crowd 3PL or warehouse, retailers can appeal to a broader range of clientele and ensure happy customers by having plenty of stock and real-time updates so they get their order faster. Brands that drop ship can easily connect with limitless retail channels to get their product assortment in front of a wider audience. The ease and efficiency associated with drop ship automation eliminates the need to manually enter data or rekey information, enabling your team to focus on other aspects of your business.